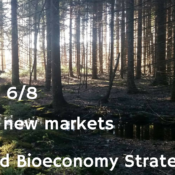 The bioeconomy has the potential to be the next major economic development, especially in rural and remote areas of Europe. Shifting to a bioeconomy is also of central importance towards fulfilling the ambitions of Paris Agreement in terms of climate change mitigation and adaptation as well as reaching the Sustainable Development Goals. Forests cover more than 40 percent of the EU’s land area. They provide the bioeconomy with renewable materials as well as other ecosystem services to create the much-needed shift to a sustainable circular economy. The use of domestically available raw materials has a positive impact on securing the supply of energy and goods. At the same time, the diversity in terms of needs and capacities between the different European regions must be acknowledged. 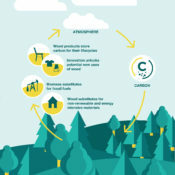 Fostering sustainable forest management throughout Europe will safeguard and avoid the risk of over-exploitation resulting from higher demands on forests. To deploy investments, the market needs to have a clear political direction. Therefore, a long‑term vision and commitment to developing the European bioeconomy is needed. Ambitious goals need to be set and actions must be monitored over time. 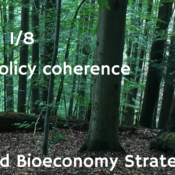 EUSTAFOR supports a stable and coherent legal and policy framework, especially in relation to the 2030 climate and energy framework and its connection with the deployment of the bioeconomy. The market value of sustainable products needs to be enhanced by promoting sustainable management of (forest) ecosystems and the supply of raw materials. An objective and comparative evaluation of the ecosystem services and non-wood products which forestry provides to society should be better recognized and more fully valued. The evaluation should incorporate market-based tools. 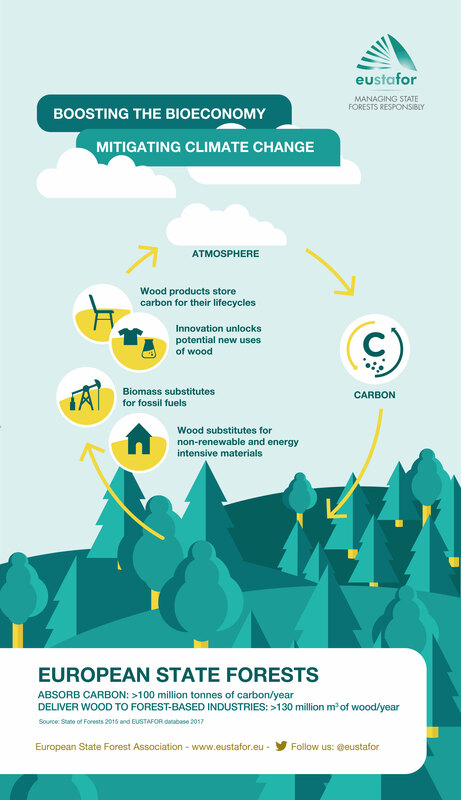 Sustainably managed forests and wood use deliver a triple carbon effect in mitigating climate change. They provide emission removal, carbon storage, and carbon displacement if wood is used to substitute for non- renewable and highly energy-intensive materials. Policy needs to recognize the forest sector’s total positive contribution to mitigating climate change and foster sustainable multifunctional forestry. Specific instruments such as Green “climate-fit” Public Procurements (e.g. supporting wood such as Cross-Laminated Timber (CLT) over other materials for use in construction) need to be adopted. The connectivity and innovation capacity of the forest sector should be promoted. A strong innovation strategy and resources for technology transfer could significantly accelerate the development of the sector. In order to provide adequate conditions and to develop best practices in forestry operations, the development and research of silvicultural practices needs to be strengthened and technological developments and digitalization need to be supported. Creating value and profitability in all parts of the value cycle are key to a truly innovative bioeconomy. 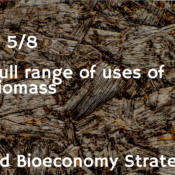 Restrictions on the use of biomass for certain products or supplies could lead to market distortions and cap research, innovation and development. Restrictions on biomass use could result in sub-optimal value cycles, limit innovation and penalize certain areas or industries over others. There is a need to improve the flow of materials and residues within and between different industries and users in order to foster the efficiency of forest-based value cycles. Policy should, therefore, promote innovative pathways and new market opportunities for the use of wood. For example, improved product design rules could provide better opportunities for the recycling and reuse of forest materials. 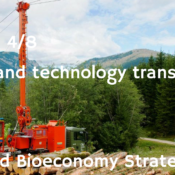 In developing the bioeconomy, the mobilization of woody biomass needs to be fostered following the principles of Sustainable Forest Management. More support should be given to technological developments, workforce education and the enhancement of silvicultural practices. 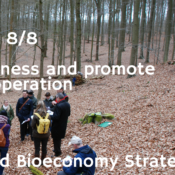 EUSTAFOR recognizes the potential of a Bioeconomy Knowledge Center to improve sector competitiveness by developing cooperation, reaching new markets and better valuating the services provided by Europe’s forests. 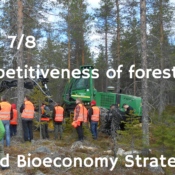 The bioeconomy should be perceived as an opportunity to ensure the vitality of forest ecosystems, to promote green employment and increase the social value of forestry for the benefit of all. 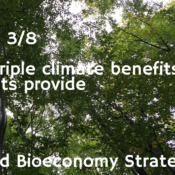 Full advantage must be taken of the synergies created by using wood and improving land management, by raising consumer awareness about the full bio-based value cycles and by promoting cooperation among experts and stakeholders. EUSTAFOR, the European State Forest Association, gathers together 33 State Forest Management Organizations from across Europe, which often are the single largest forest manager and biomass suppliers in Member States. 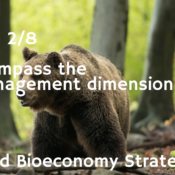 State Forest Management Organizations provide biomass to a multitude of forest-based value cycles and, thanks to their scale, stability, reliability and openness to cooperation they can catalyze the development of the bioeconomy. EUSTAFOR members employ leading forest experts with deep knowledge of forest management. In fact, the role of state foresters is to balance different demands through multifunctional forestry in response to local conditions and societal needs, by advancing sustainability and creating value in state forests. EUSTAFOR’s views are based on the management expertise, which comes from their lengthy experience with a full diversity of European forests. NOTE: Any statement in this document is to be considered as a reflection of the best available professional expertise and does not necessarily reflect the political commitments of individual member organizations.